Abstract. Sea-ice thickness on a global scale is derived from different satellite sensors using independent retrieval methods. Due to the sensor and orbit characteristics, such satellite retrievals differ in spatial and temporal resolution as well as in the sensitivity to certain sea-ice types and thickness ranges. Satellite altimeters, such as CryoSat-2 (CS2), sense the height of the ice surface above the sea level, which can be converted into sea-ice thickness. Relative uncertainties associated with this method are large over thin ice regimes. Another retrieval method is based on the evaluation of surface brightness temperature (TB) in L-band microwave frequencies (1.4GHz) with a thickness-dependent emission model, as measured by the Soil Moisture and Ocean Salinity (SMOS) satellite. While the radiometer-based method looses sensitivity for thick sea ice (> 1m), relative uncertainties over thin ice are significantly smaller than for the altimetry-based retrievals. In addition, the SMOS product provides global sea-ice coverage on a daily basis unlike the altimeter data. This study presents the first merged product of complementary weekly Arctic sea-ice thickness data records from the CS2 altimeter and SMOS radiometer. We use two merging approaches: a weighted mean (WM) and an optimal interpolation (OI) scheme. While the weighted mean leaves gaps between CS2 orbits, OI is used to produce weekly Arctic-wide sea-ice thickness fields. The benefit of the data merging is shown by a comparison with airborne electromagnetic (AEM) induction sounding measurements. When compared to airborne thickness data in the Barents Sea, the merged product has a root mean square deviation (RMSD) of about 0.7m less than the CS2 product and therefore demonstrates the capability to enhance the CS2 product in thin ice regimes. However, in mixed first-year (FYI) and multiyear (MYI) ice regimes as in the Beaufort Sea, the CS2 retrieval shows the lowest bias. 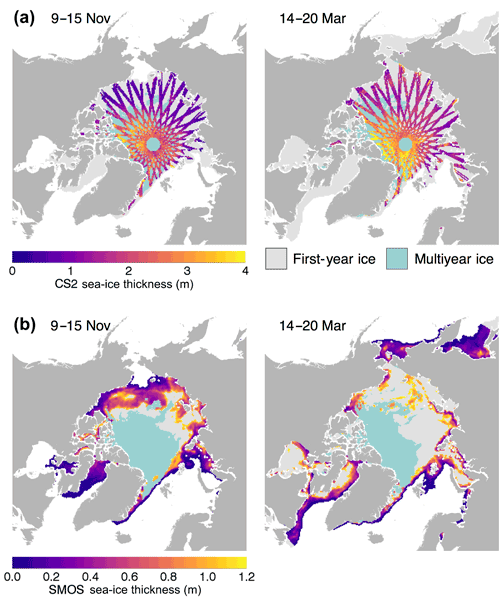 How to cite: Ricker, R., Hendricks, S., Kaleschke, L., Tian-Kunze, X., King, J., and Haas, C.: A weekly Arctic sea-ice thickness data record from merged CryoSat-2 and SMOS satellite data, The Cryosphere, 11, 1607-1623, https://doi.org/10.5194/tc-11-1607-2017, 2017. 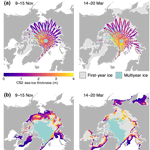 We developed the first merging of CryoSat-2 and SMOS sea-ice thickness retrievals. ESA’s Earth Explorer SMOS satellite can detect thin sea ice, whereas its companion CryoSat-2, designed to observe thicker perennial sea ice, lacks sensitivity. Using these satellite missions together completes the picture of the changing Arctic sea ice and provides a more accurate and comprehensive view on the actual state of Arctic sea-ice thickness.